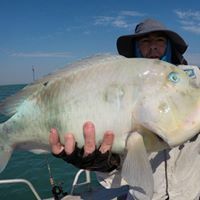 How’s this big Blue Bone fish also called Parrot fish, caught at the Daly Region this RunOff ? Not just barra during the runoff, all sorts of fish are targetted and caught. Humbug Fishing can take you fishing all year round all over the Top End Coast so get in contact with us and let us take you fishing!